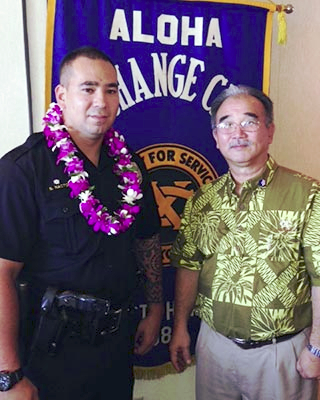 Aloha Exchange Club President Jay Kimura is seen with ‘Officer of the Month’ Shea Nactor. The Aloha Exchange Club of East Hawaiʻi recognized Officer Shea Nactor on Thursday (October 24) as the East Hawaiʻi “Officer of the Month” for October. Nactor, a Puna Patrol officer, was honored for his outstanding enforcement of drunk driving and drugged driving laws. During September, Nactor arrested 12 individuals for driving under the influence. That was more than all the other officers in his district combined. Sergeant William Derr, who nominated Nactor for the award, noted that Nactor shows “outstanding initiative” by logging many miles on his car as he patrols the roads for impaired drivers in a proactive effort to prevent collisions. Derr added that Nactor is a team player who assists other officers with any call that involves the potential for violence. In one such case, Nactor responded to a report of a domestic dispute on September 2 in Mountain View and learned that a man had threatened his son with a machete. After Nactor volunteered to help secure the house while waiting for a search warrant, the suspect emerged with what appeared to be a rifle and yelled at officers, demanding that they shoot him. Nactor and another officer maintained control of the situation without overreacting and were able to persuade the man to drop the weapon and surrender. This is the second time this year Nactor was named “Officer of the Year.” In July he was honored for tracking down a murder suspect within three hours of a shooting in Nanawale Estates.